When I was just a little girl, I asked my mother “What will I be?” Pat came the reply “Doctor of course!” This reply was quite spontaneous, she had her own reasons – it being a noble profession, me being a studious, hard working type, or maybe because she herself wanted to be a doctor and see me realise her dream. Whatever her reason, I never doubted her and believed it so myself for a very long time. Not because I was passionate about that field or anything, but just that I had never given a thought to anything else. Who had the time to think of anything else but studies? Our education system with its meaningless, outdated methods of ranking and rote learning took the interest out of any subject that we might have ordinarily liked. All it does is takes you through this dark, seemingly endless, narrow tunnel which has just enough breadth for one person to run and it does make you run, unless you want to be trampled over by someone else, it makes you run fast, blinded, with no sense of direction cause there are no other avenues, and leaves you gasping for breath till the end as you are suddenly forced out it, moving into the path where others push you, as you have had absolutely no time to think! As an adolescent I moved on to listening more to my friends than to my mother, and when I heard these exaggerated stories about how much studies and hard work one had to put into becoming a doctor, I just couldn’t make myself take that choice as I felt that I had worked hard enough all my school life and I was more than ready to stop. So when most of my friends opted for the Commerce stream, I just blindly followed them. I did not even consider Arts or what options one had by going into that field, simply because my school grades were too ‘superior’ to take Arts as an option! Oh we were so foolish, the system of education so narrow and the society so very ‘Grade’ oriented that I ended up making one wrong choice after the other for myself. Of course I continued getting good grades even through college (I guess it came naturally to me after years of practice!). After graduation when it was time to move out of college and make another choice, I had options which sounded even more limited to me – CA (Chartered Accountant), MBA or get married! The first option was completely out for me as I was terrible at finance, third was a long way to go, so that left me with just one choice, MBA, that I did not know much about. I gave myself a break year trying to figure out what else I could do, I did a computer course which was in vogue those days, I continued my French at Alliance Francaise, I volunteered at a stray dog rescue centre and I continued my modelling which gave me a steady source of income. However at the end of the year since I was still unsure about which field to pursue and so with nothing better to do I gave my entrance exams for MBA and got admission in one of Mumbai’s best business schools! Two years of MBA went by but nothing really appealed to me as I never wanted to get into the corporate world, but I kept floating through, following the crowd as usual. I almost quit inbetween but my then boy friend, now husband thankfully pulled me through. Finally, I gave my exams, I completed my studies, I became a Master in Business Administration, I became a Manager. i love ur pic mehroo, u look absolutely stunning. I never knew you wanted to be a doc. I desperately wanted to be a gynecologist till it actually came to studying and then a ballet dancer and then a Hindi film actress as running round trees seemed far easier hahaha. I looooove the photo of you with your doggies. So sweet! Swell pic and very nicely written! 🙂 I love the song! It reminds me of my dad! He used to say the same words! Thanks Karuna glad you liked it and yes it is a beautiful song and very true too. Thanks sirisha, you are too kind as always! 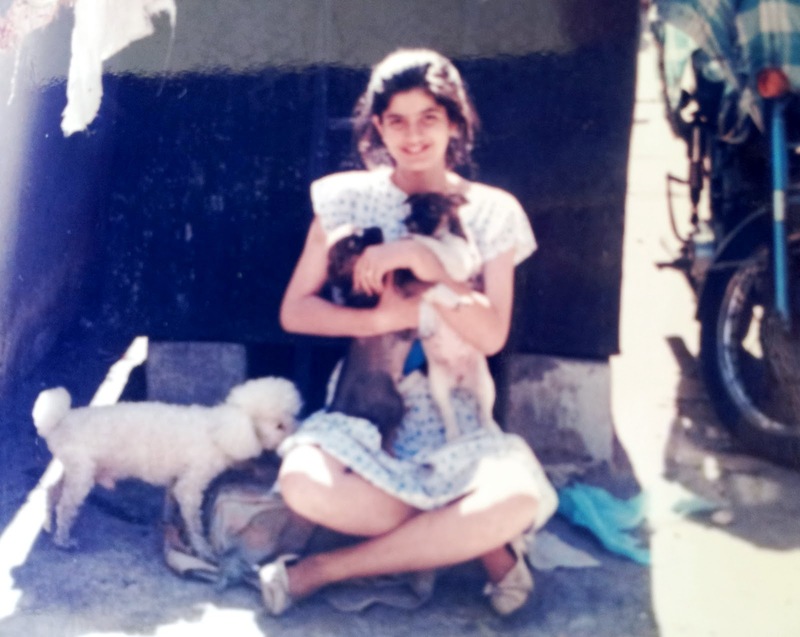 mehroo, u know something, when i see the ease u have with animals always amuses, i dont have that ease with them and i think its because i was never associated with any pets love the way fravu played with those animals in the dean's farm, miss those days dear, proved that he is your son.